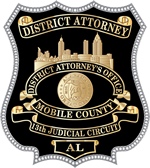 The Association of Government Attorneys is pleased to announce that on August 9, 2017, Mobile County District Attorney Ashley Rich has been award with the William J. Schafer award for excellence in capital litigation for recognition for her outstanding advocacy on behalf of the State of Alabama and victims of violent crime and in gratitude for her integrity, support and many contributions to capital litigation jurisprudence nationwide. “I was shocked and surprised and honored all at the same time. I believe so much in the work everyone does at my office to prosecute criminals and make Mobile and the State of Alabama a better place. It is my calling and so this lifetime achievement award is a great honor.” District Attorney Ashley Rich.